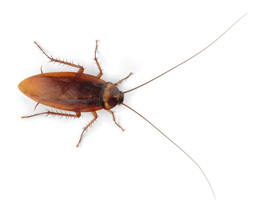 Cockroach pest control services in Staines, Weybridge, Twickenham, Shepperton, Richmond. The name of the order is derived from the Latin word for “cockroach”, blatta. The English word cockroach is derived from the Spanish cucaracha through folk etymology. Cockroaches exist worldwide, with the exception of the polar regions. There are roughly 4,500 species in six families. Among the most well-known species are the American cockroach, Periplaneta americana, which is about 3 cm long, the German cockroach, Blattella germanica, about 1½ cm long, the Asian cockroach, Blattella asahinai, also about 1½ cm in length, and the Oriental cockroach, Blatta orientalis, about 2½ cm. Tropical cockroaches are often much bigger, and extinct cockroach relatives such as the Carboniferous Archimylacris and the Permian Apthoroblattina were several times as large as these. Cockroach infestations are increasing as the climate becomes warmer. They can be treated effectively in various ways using chemicals and bait boxes. Preventative measures include keeping all food stored away in sealed containers, using rubbish bins with a tight lid, frequent cleaning in the kitchen, and regular vacuuming. Any water leaks, such as dripping taps, should also be repaired. It is also helpful to seal off any entry points, such as holes around baseboards, in between kitchen cabinets, pipes, doors, and windows with some steel wool or copper mesh and some cement, putty or silicone caulk. Once a cockroach infestation occurs, chemical controls can help alleviate the problem.